I confess, part of the reason this review wasn’t done sooner is that I find it difficult to find the right words to describe American Scrap. I guess I want to start with a story, a true story, from the teenage life of one Hayduke X. Let’s go back to the late 80’s where gangly, nerdy young Hayduke is out in front of his house talking to a friend in the driveway. The friend has his car radio turned on while they chat. Then it happened. Mid-sentence, Hayduke gets distracted by a song that comes on the radio. He completely loses his train of thought. His friend is very confused. The song was Orange Crush from R.E.M.’s Green album. Not very metal, I know, but there you have it. That album became one of the key albums in my life. I obsessed about it for literally years. I can still put it on and get drawn right back to so many good memories from my later teen years. Green is one of the best examples I personally have of the importance of music. The next album to hit me so suddenly, so completely, and so obsessively? Maybe you’ve guessed it. It’s American Scrap. Sure there have been other albums that I’ve loved, even obsessed over, but nothing else has hit me quite like that until I pressed play on Bury Me Deep (track one of the album). Time will tell if American Scrap can truly hold up the same way, but I don’t have decades to wait. I have to write this review! So, what is all the fuss about? 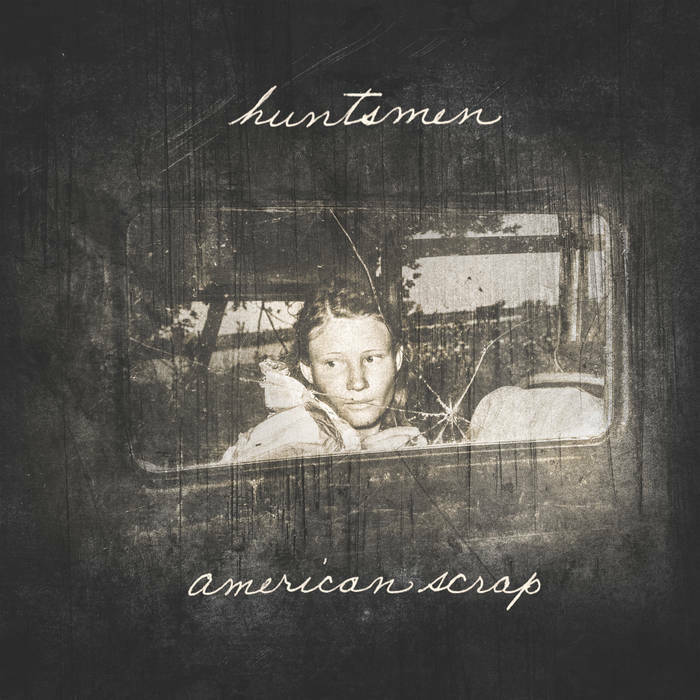 Huntsmen are just some doomy rock band from Chicago, right? That’s true to agree. The quartet is from Chicago and does combine a sound that incorporates elements of doom metal, rock, post-rock, and even Americana to create a sound that is both unique (can you think of a band to compare them too?) and entirely, comfortably, familiar. The album has a dynamic range of sounds, styles, and levels. Vocally, for example, you can find plaintiff singing by vocalist Chris Kang, three part harmony with bassist Marc Stranger-Najjer and drummer Ray Knipe joining the fun, harsh vocals by Stranger-Najjer, and even haunting guest vocals by Aimee Bueno. Instrumentally, the riffs, tight and well thought out rhythms, and song structure are all pitch perfect. Though there are many parts throughout the album that are pretty mellow, the entirety of American Scrap is emotionally heavy. Huntsmen weave a sonic journey of hope and betrayal, love and misery, that ultimately leads to the utterly devastating final track The Last President. The journey I’m speaking of here is entirely musical, but is mirrored lyrically as well. On the above mentioned final track, the lyrical content is about the last ever president of the United States. In some near future, an apocalyptic event has occurred. The president understands that the end of humanity is inevitable. She poisons her children in their final dinner, then lovingly tucks them into bed, knowing they will never awaken. After they fade into unconsciousness and head towards death, she hangs herself. The song is beautifully haunting, peaceful and painful at the same time, musically gentle, but so inconceivably heavy. I’ve run out of words. I’m not sure how to wrap up this review. I suppose I will just say that you need to experience it for yourself.